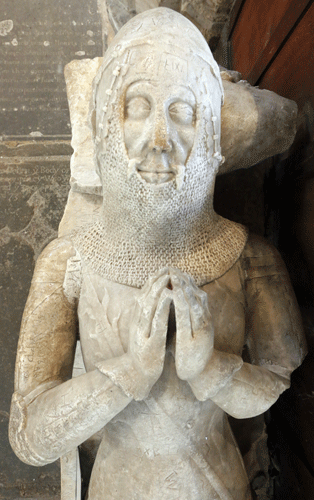 John Daubyngy (1346) Note the unusual design of this monument, the incription, the shields and the helmet. 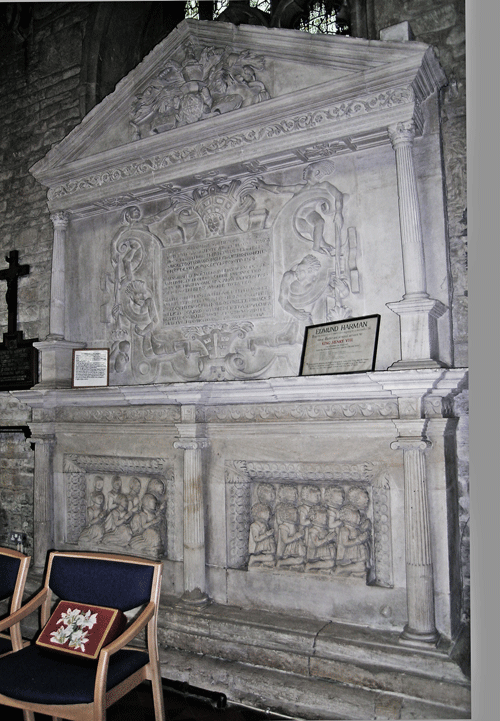 Photographs of the upper half, full length and a plan drawing. 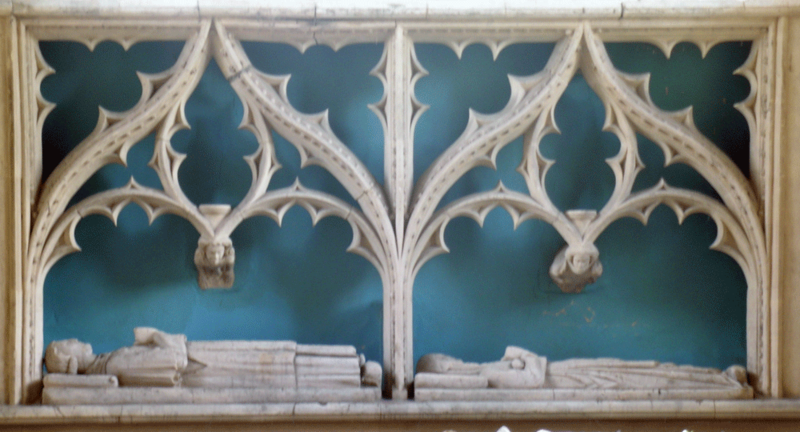 Alabaster effigies on fragmentary tomb chest with lost canopy. 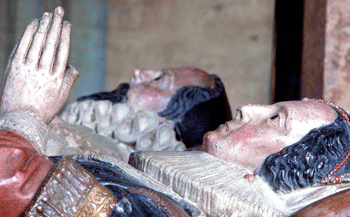 They do not belong together: look at the collars, for example. 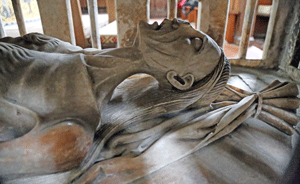 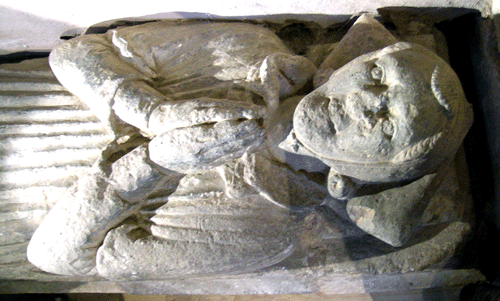 He is said to be Sir Thomas Wyke (1470): she is unknown but earlier 15th century. 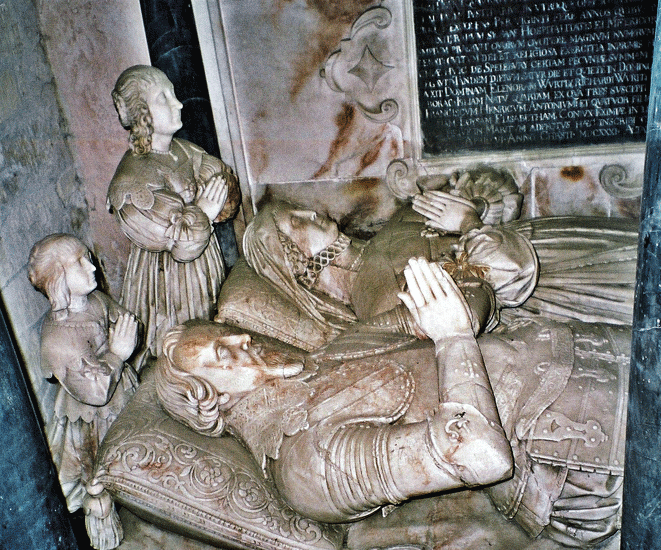 Lord Chief Justice Tanfield (1625) & Family. 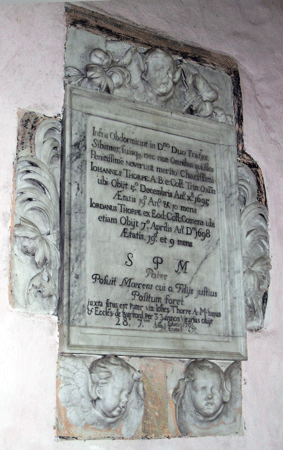 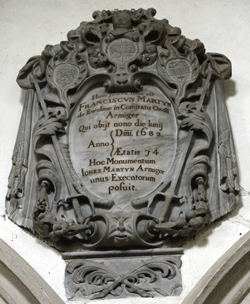 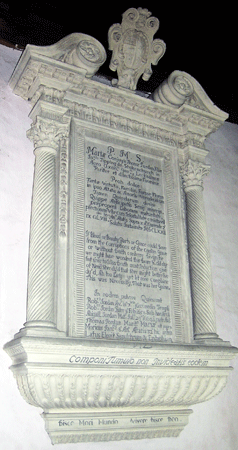 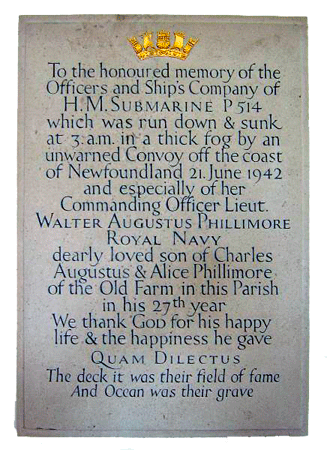 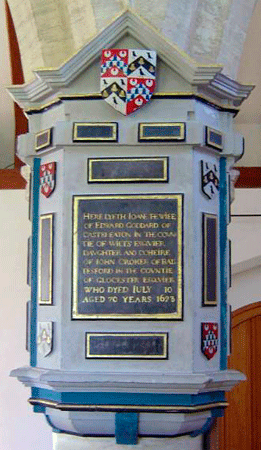 Erected by his Wife in 1628 & attrib. 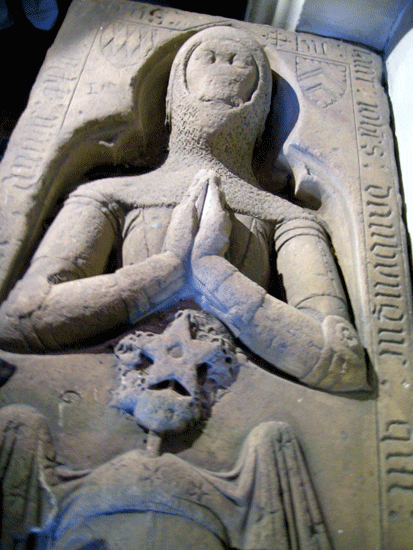 to Gerard Christmas. 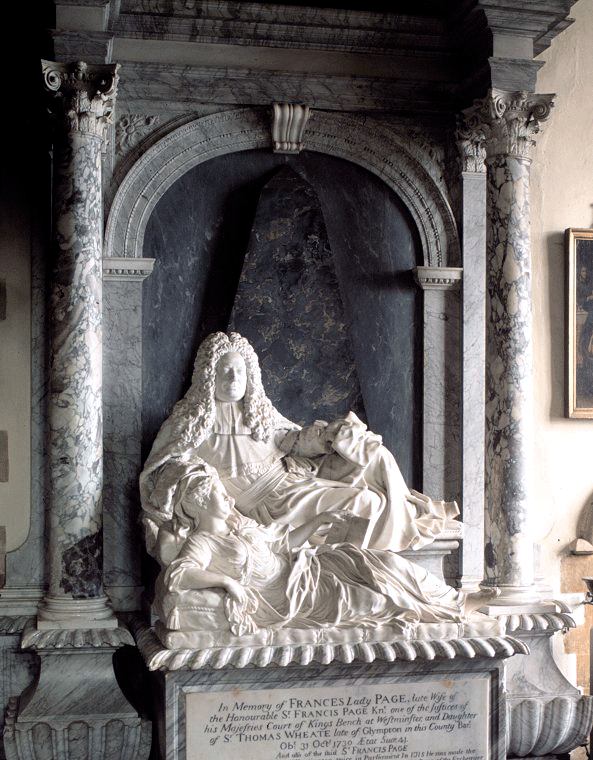 Alabaster and black marble. 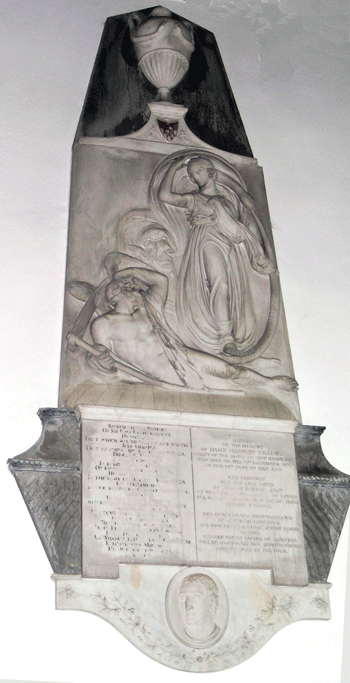 Far left is a wide angle view of the monument while left and above show various details. 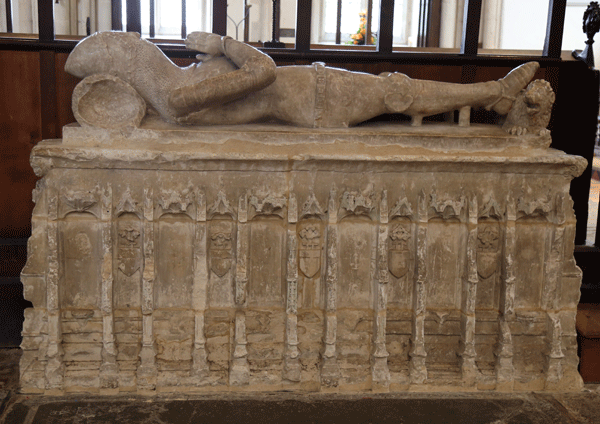 The recumbent effigies are, of course. 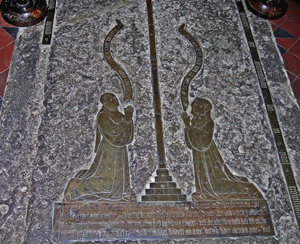 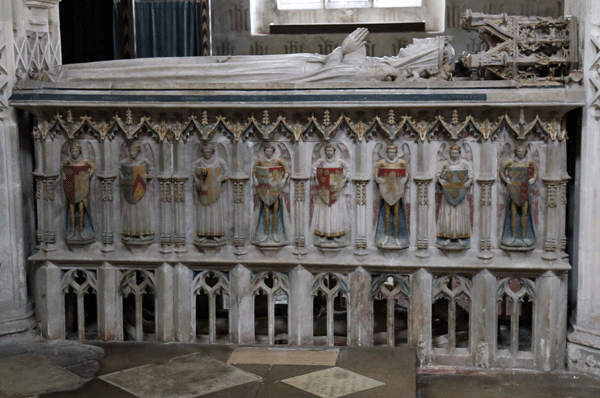 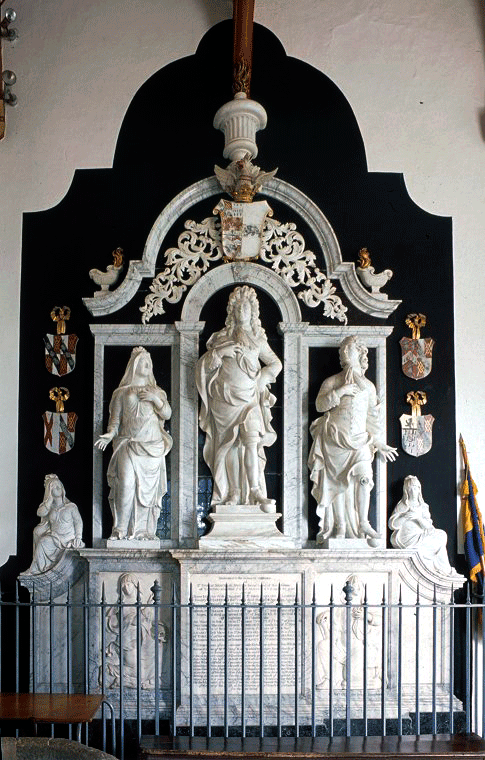 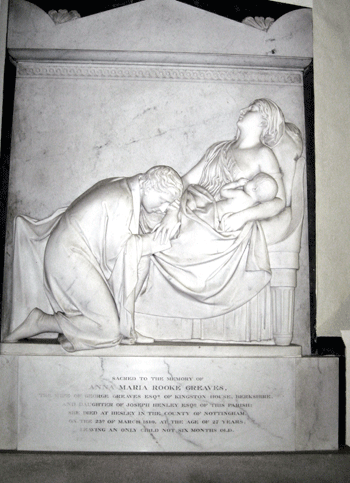 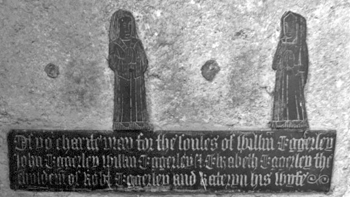 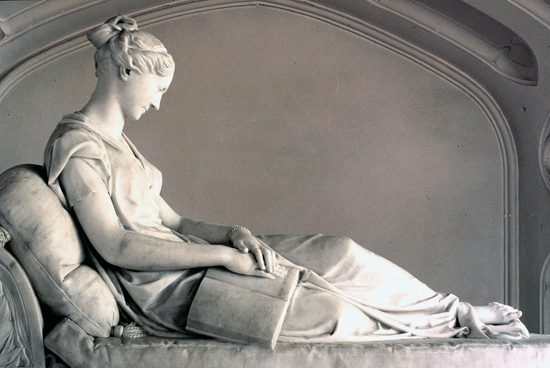 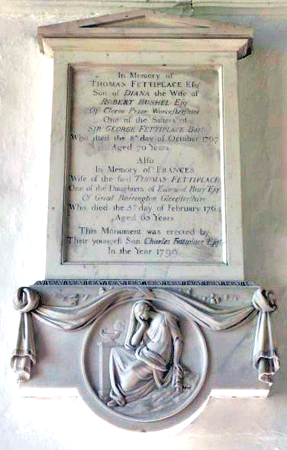 of the judge and his wife; at the head of the monument (far left) kneels a figure of their daughter, Elizabeth. 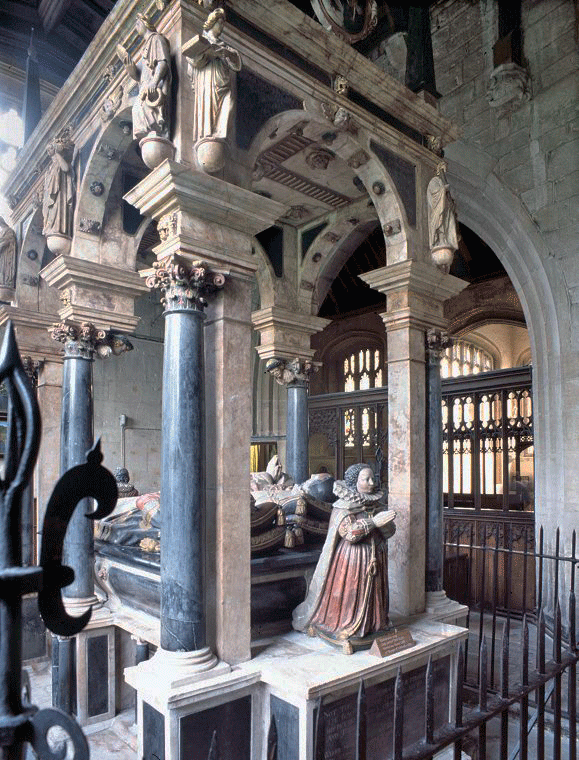 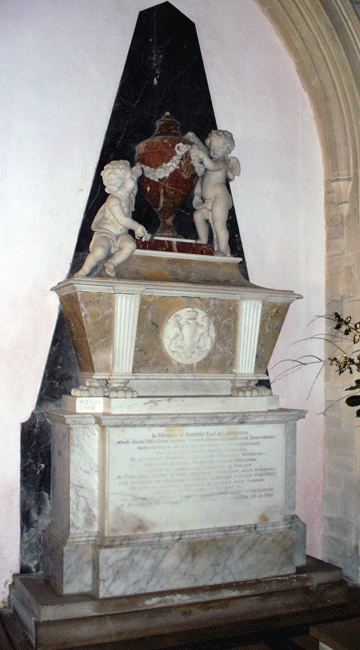 At the foot of the monument kneels their grandson, Lucius Cary, 2nd Lord Falkland, who is somewhat incongruously flanked by a demi-figure of Lady Tanfield and a heraldic device. 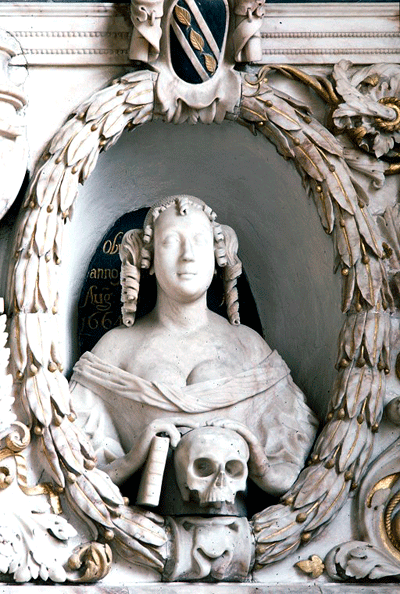 In the lower stage lies just one skeleton with a long neck and oddly shaped skull. 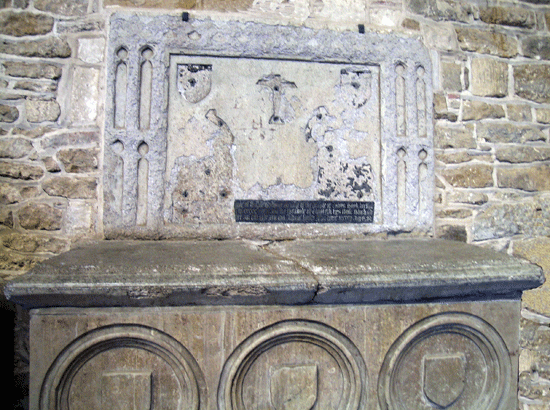 Right top: John Spicer (1427) & Wife The inscription - in verse records their gift of a rood loft, now gone, and a 'gabled window' to the church. 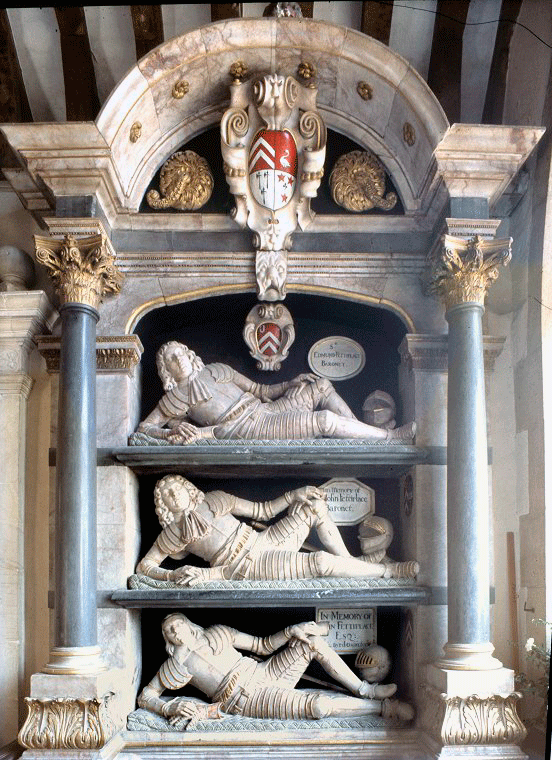 The Blake Monument (William (1695), Sara (1701) & Francis (1691) 3 marble busts under pediment Lady of the 13th century on tomb chest. 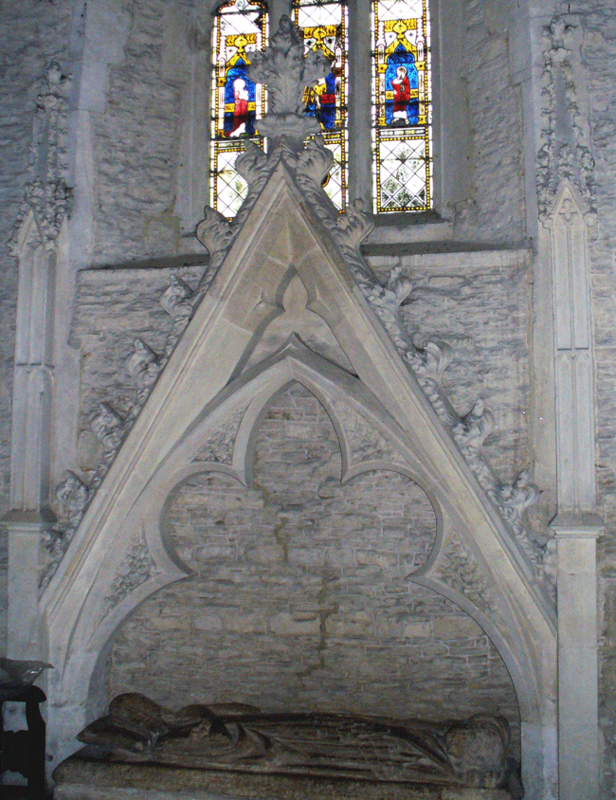 The church is usually open. 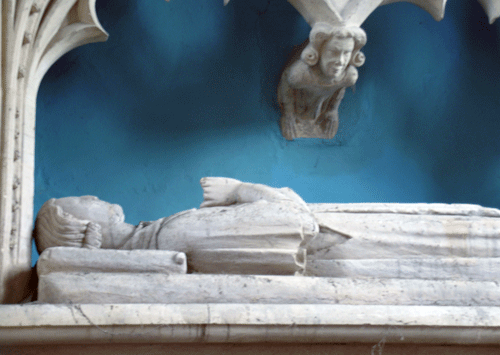 No charge. 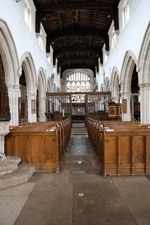 You can park in a free small car park just across the road from the church; toilets there too, although best avoided. 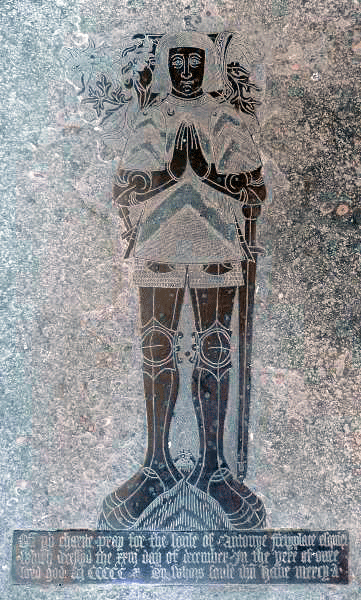 Right & Below Centre Right: Knight c. 1400. 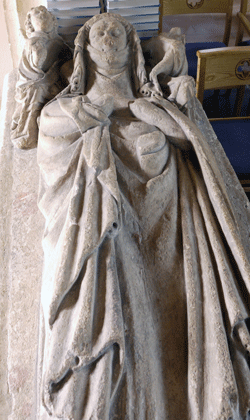 Alabaster. 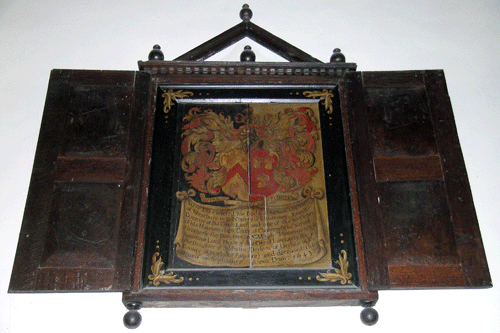 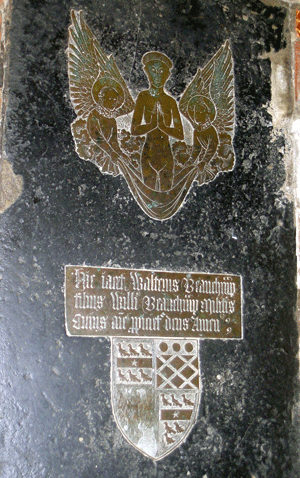 Segrave arms; said to be Hugh Segrave 1387. 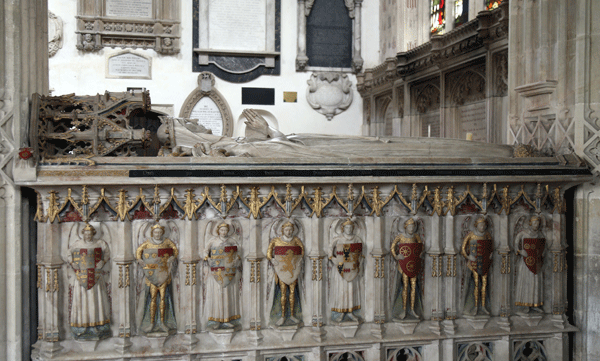 The tomb chest with blank shields does not belong. 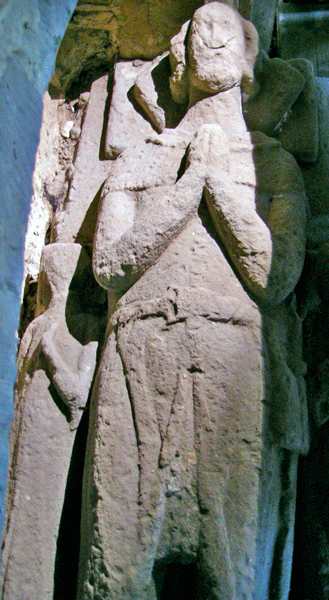 Who can this be? 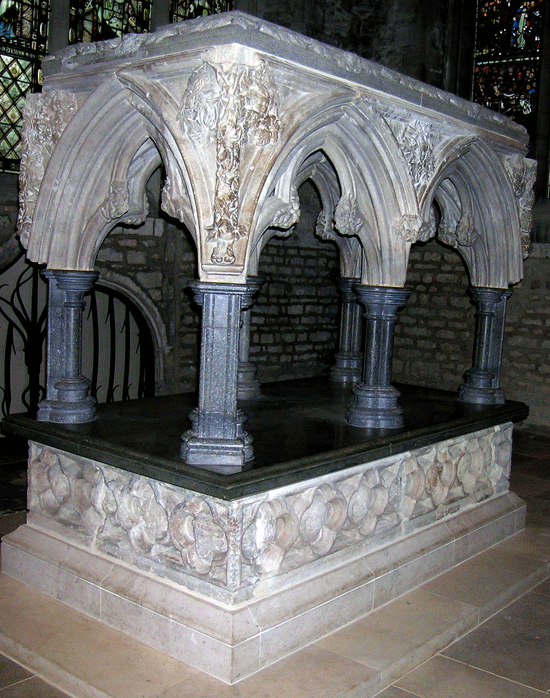 Dorchester Abbey is not a cathedral although it was in in Anglo-Saxon times until the first Norman bishop, Remigius, moved the see to Lincoln in 1072-73; Dorchester then continued as a church of secular canons until it was refounded by Bishop Alexander of Lincoln as a Augustinian Abbey. 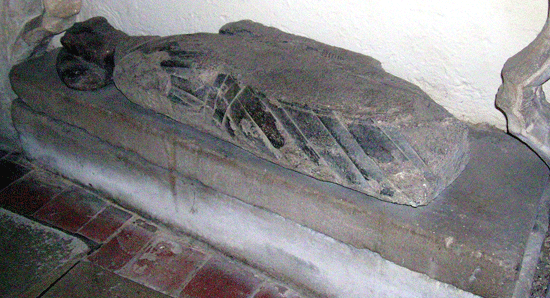 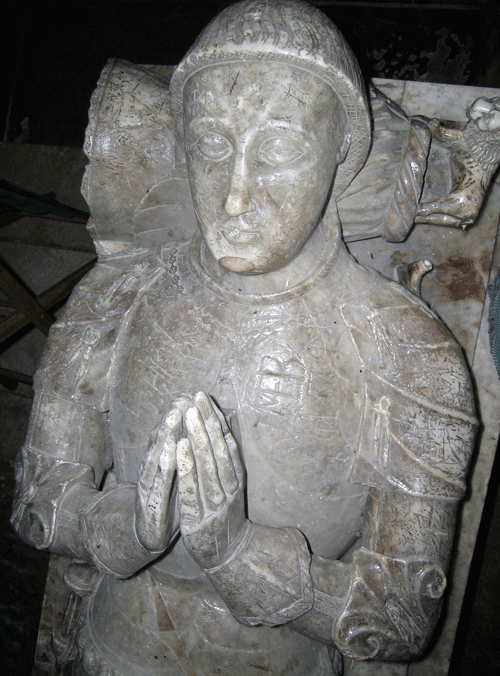 This may be a retrospective effigy of a bishop of Dorchester or, less likely, of a bishop from another see. 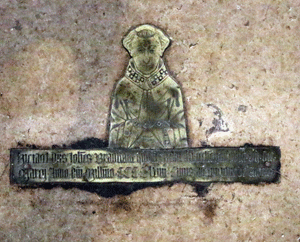 See below brass matrices. 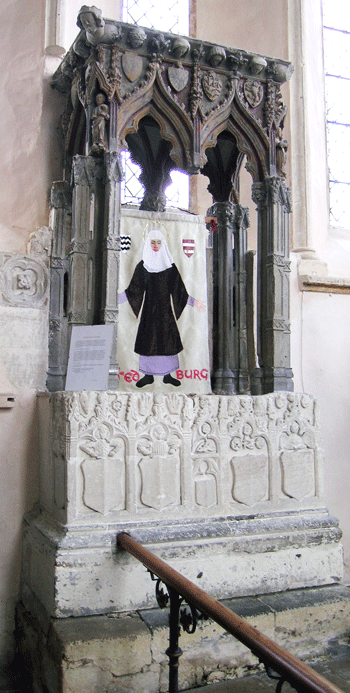 Left: Shrine of St . Birinus A new and magnificent marble shrine of marble was constructed in 1330. 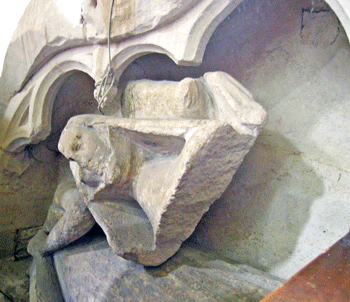 This was destroyed at the Reformation but fragments were found in the 19th century as part of the masonry blocking a doorway . 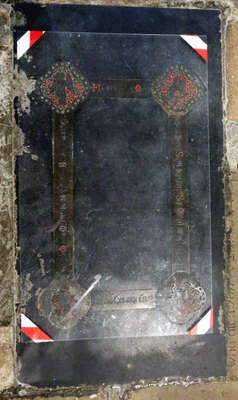 These fragments were reused in the construction of the present shrine, designed by F Russell Cox in 1964. 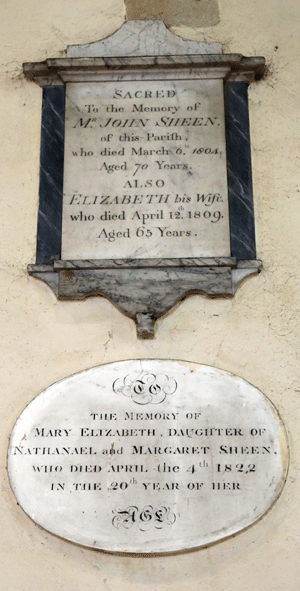 Near Right: John Sheen (1804) & Elizabeth (1809)/Mary Elizabeth Sheen (1822) Daughter of Nathaniel & Margaret Sheen. 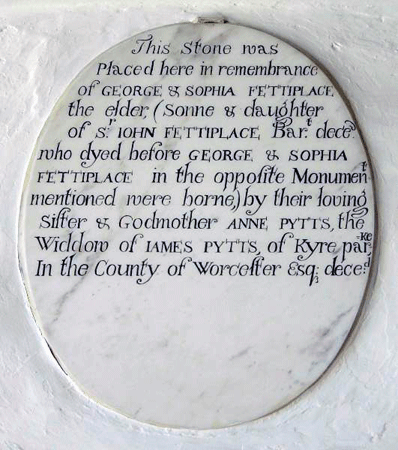 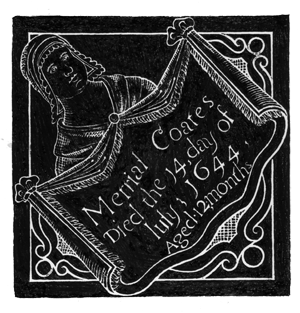 Note: There are a number of stones, particularly in the nave, which have been long used as paving slabs and are consequently very worn; these include matrices, incised slabs, ledger stones and grave stones brought in from the churchyard. 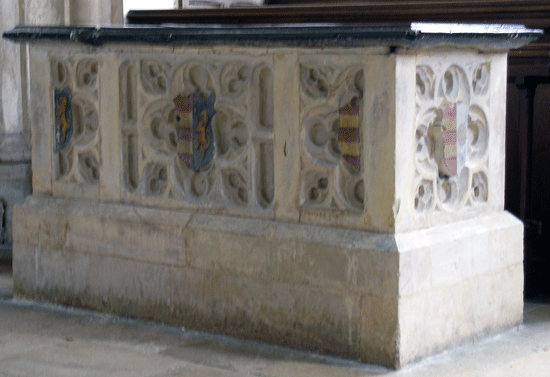 Some of these are covered by fixtures and fittings, one is even lies underneath by the feet of a grand piano. 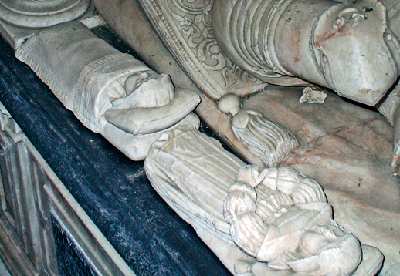 These really should be recorded (I did not have the time it would take) and any worthy ones protected from further wear and damage. 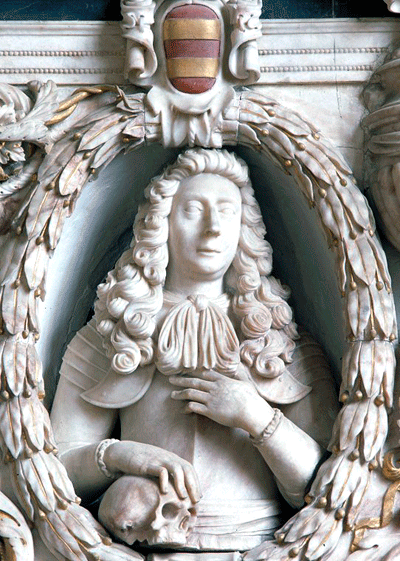 Alabaster. 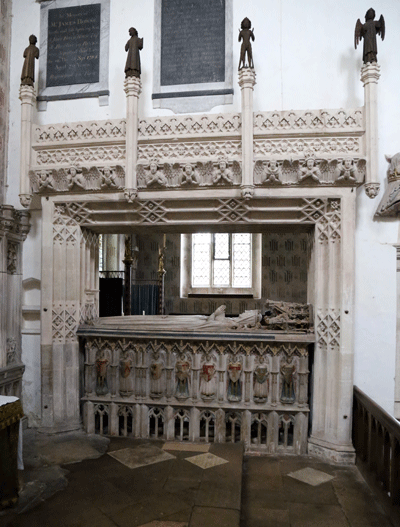 Inside the open arcading of the lower part of the tomb chest is a cadaver effigy, which can just be seen, and painted on the ceiling above this are the figures of St Mary Magdalene, John the Baptist and the Annunciation. 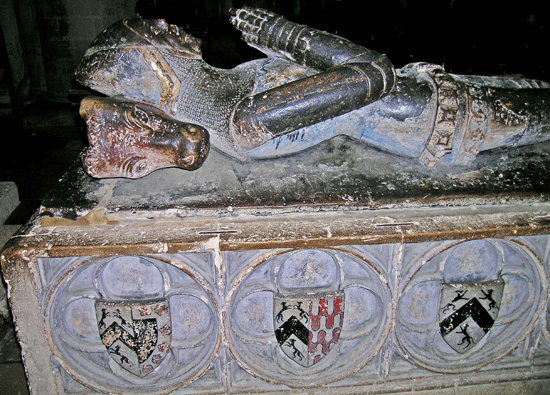 Much of the colouring on the tomb chest is original. 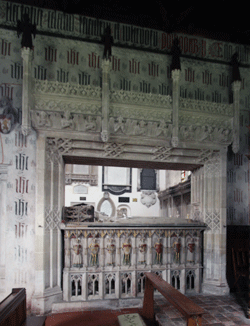 The chest has been shortened at the west; it is said to have originally stood in the chancel and been moved to the present position and the canopy added in the later 15th century. 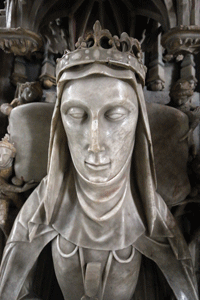 Alice was the granddaughter of Geoffrey Chaucer the Poet and her husband was William de la Pole, 1st Duke of Suffolk. 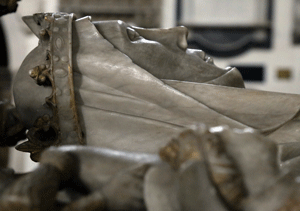 The latter was a favourite of Henry VI and became the principal power behind the throne on his return to England from the French wars. 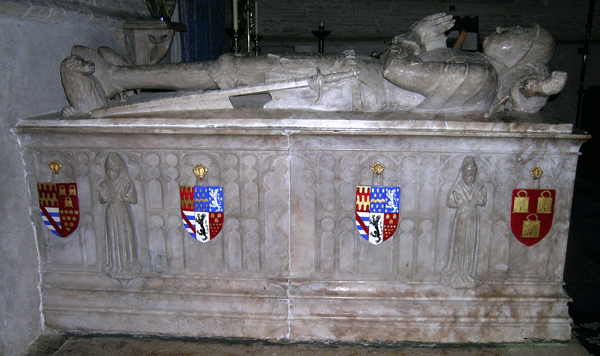 He was blamed for failures of the government and the loss of the French possessions which led to his impeachment by the Commons. 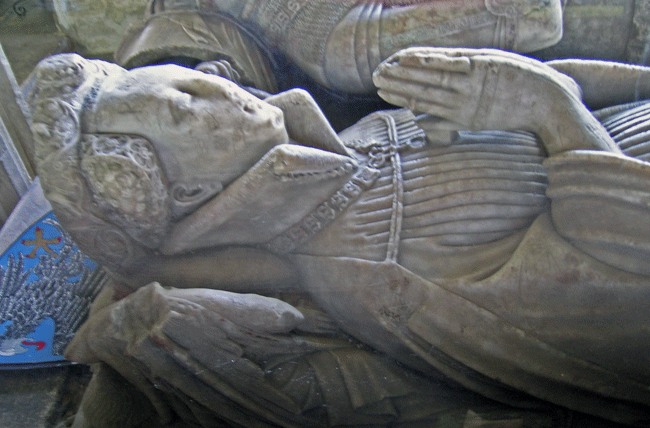 He was pardoned by Henry VI and sent into exile. 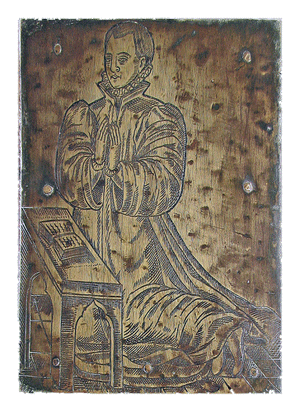 However the ship which carried him was intercepted by another, St Nicholas of the Tower; he was captured and taken aboard where he was subjected to a mock and mocking trial. 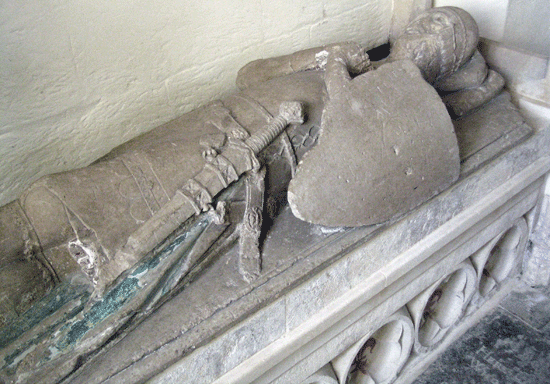 He was then taken aboard a small boat and beheaded by 'three strokes of a rusty sword'. 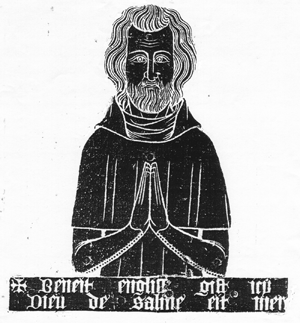 His body was thrown overboard and washed up on the shore; the incident is recorded in an old English ballad collected by Francis Childs. 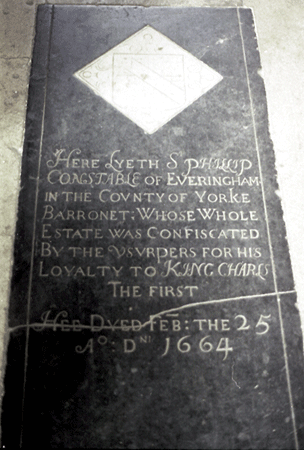 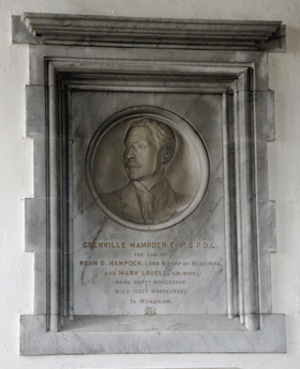 He was buried, not at Wingfield as often stated, but at Hull. 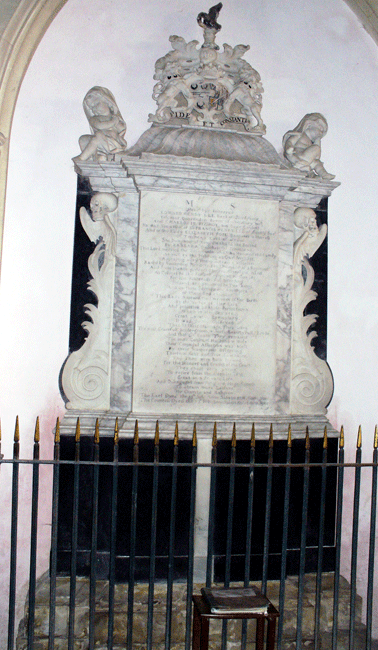 However there is no monument. 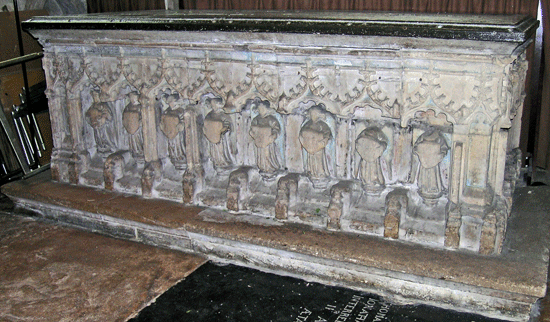 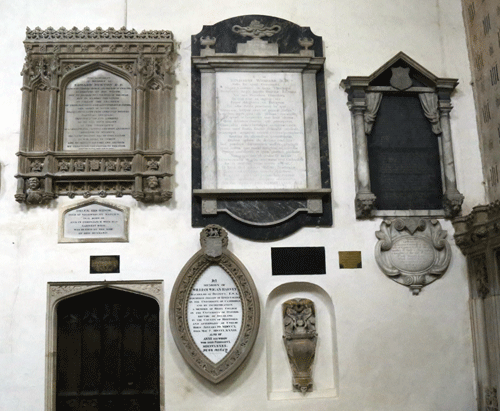 Left: A series of wall monuments from chancel, some of which have been reproduced in close up. 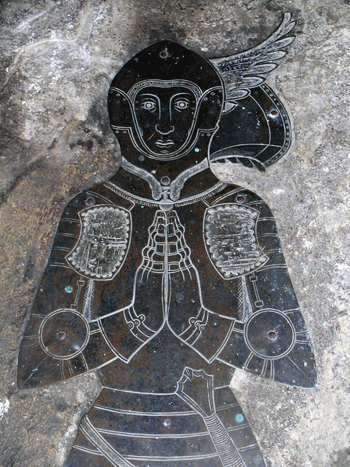 There are many other brasses without figures, mainly inscriptions and shields; I have not included these in this survey. 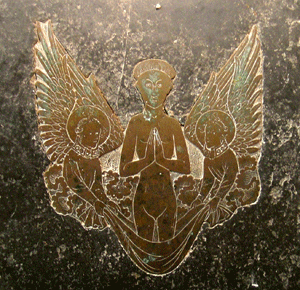 I refer the visitor to the Monumental Brass Society's survey series of books on this subject which are very complete. 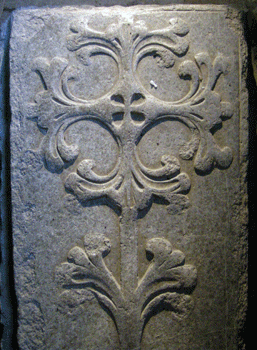 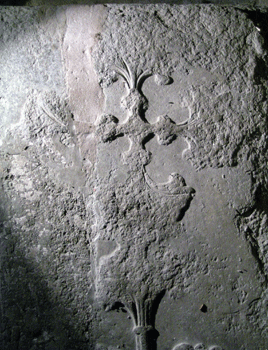 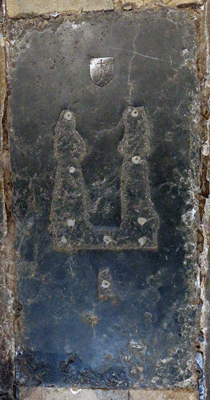 Above: Slab with foliated cross - 13th Century. 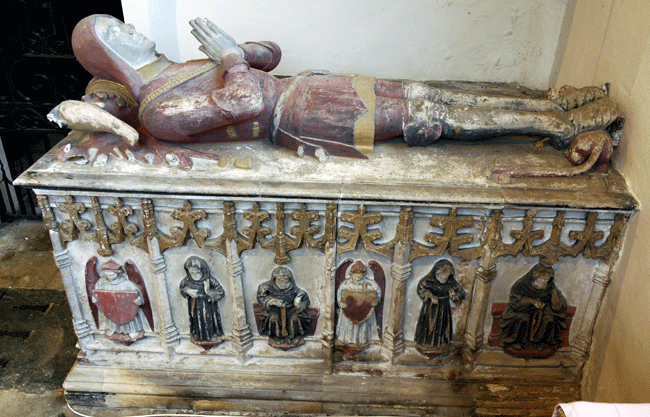 Alabaster tomb chest and effigy of mid 15th century. 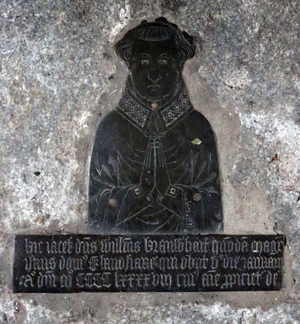 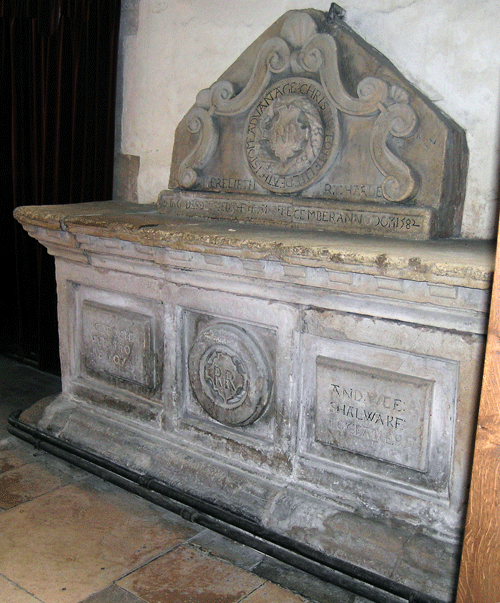 Said to be William Lovell (1455) or his son John (1465). 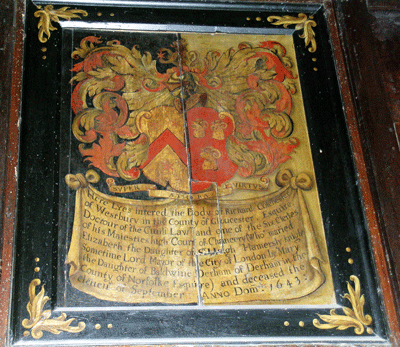 The shields were repainted in the 19th century. 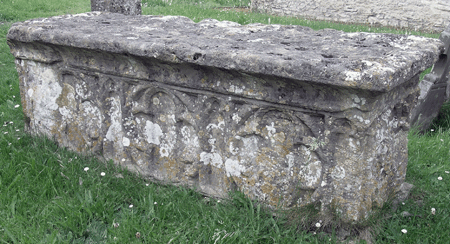 Minster Lovell Hall is a 15th century manor house, now in a ruinous condition and in the care of English Heritage. 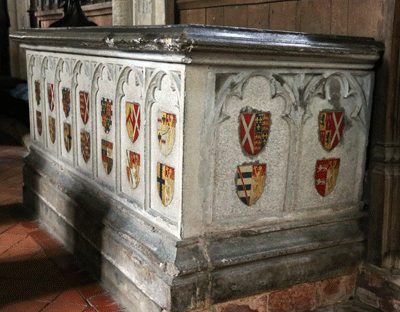 It was the ancestral home of Francis, Viscount Lovell, friend and ally of King Richard III. 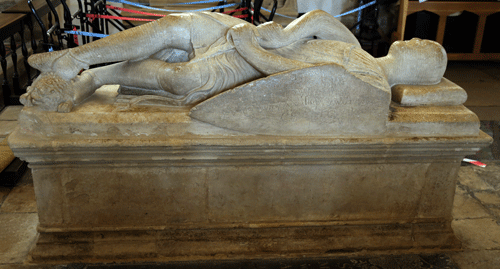 He fought for the King at the Battle of Bosworth, from which he escaped following Richard's defeat and death. 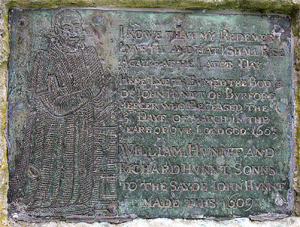 He then travelled to the north and with others helped organized a revolt in Yorkshire with the aim of capturing Henry VII; this revolt failed but he himself possibly made a second attempt to assassinate Henry in York. 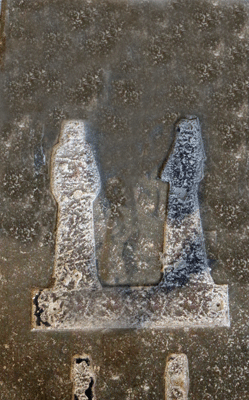 This again failed. 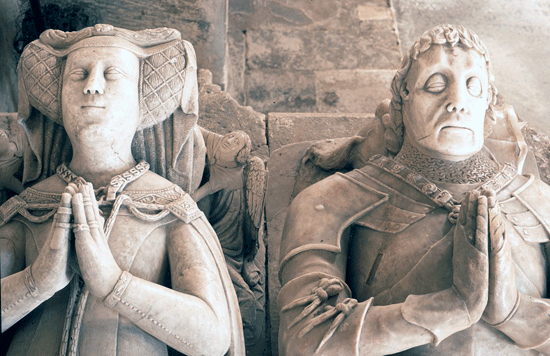 He then fled to Margaret of York in Flanders; she was the window of Charles the Rash, Duke of Burgundy and sister of both Richard III and Edward IV and the champion of the Yorkist cause being, a thorn in the side of Henry Tudor. 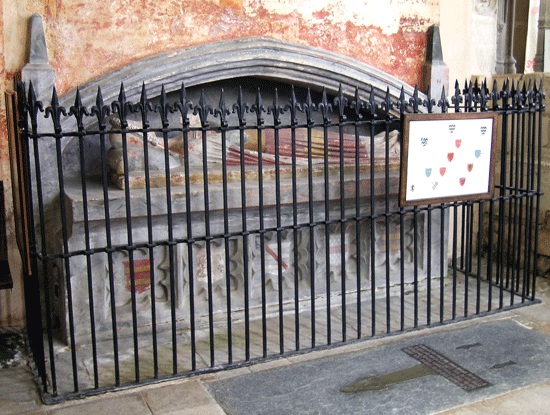 Next he travelled to Ireland to join the rebellion of the Pretender Lambert Simnel against Henry VII. 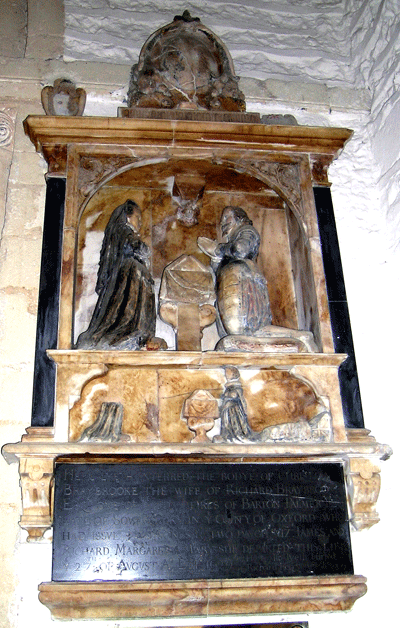 With him, was John de la Pole, Earl of Lincoln, son of the time server John de la Pole, 2nd Duke of Suffolk and his wife Elizabeth, sister of both Edward IV, Richard III and Margaret of York. 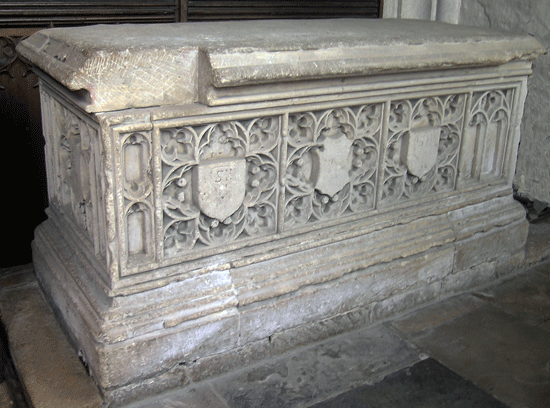 John Earl of Lincoln was a claimant to the throne and in fact had been appointed heir by Richard III following the death of the latter's young son. 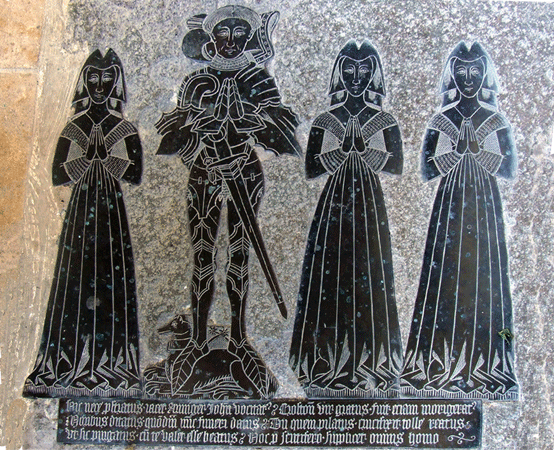 The rebels and the Tudors met at Stoke Field and there Henry VII was triumphant. 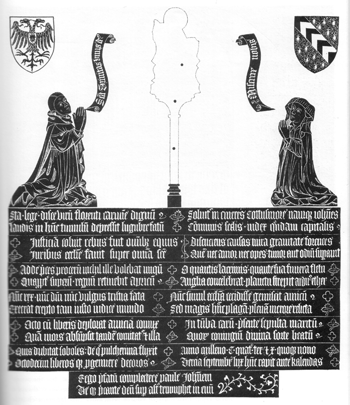 John, Earl of Lincoln, Martin Swartz, the leader of the German mercenaries and other leaders were killed but Lord Lovell disappeared, no one knows where. 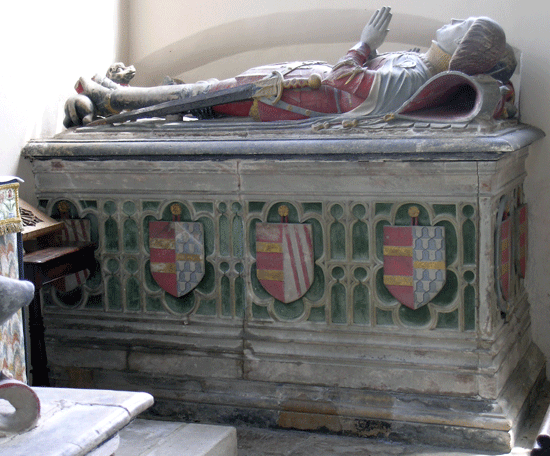 Curiously King Henry showed lenience towards Lambert Simnel, by employing him as a kitchen boy. 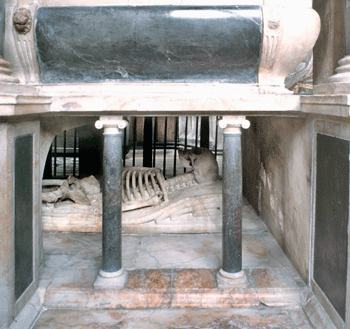 Two hundred years later in 1708 a skeleton was found sitting in a secret room in Minster Lovell Hall. 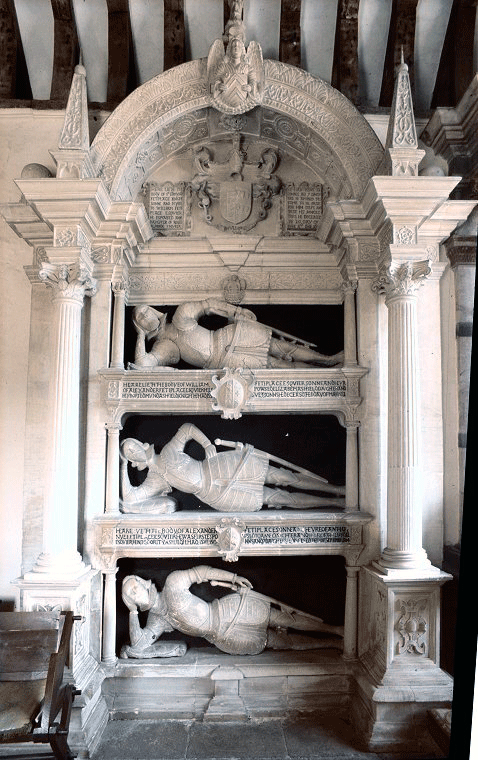 Was this the remains of Lord Lovell who had gone into hiding there after the battle? 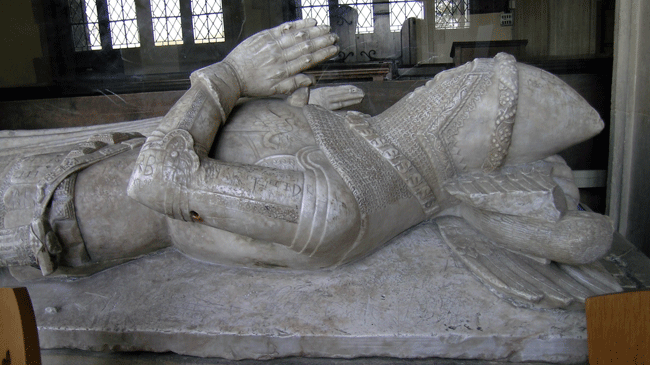 There were rumours that he had been seen travelling to Scotland but nothing definite was seen or heard of him after Stoke, the real last Battle of the Ward of the Roses. 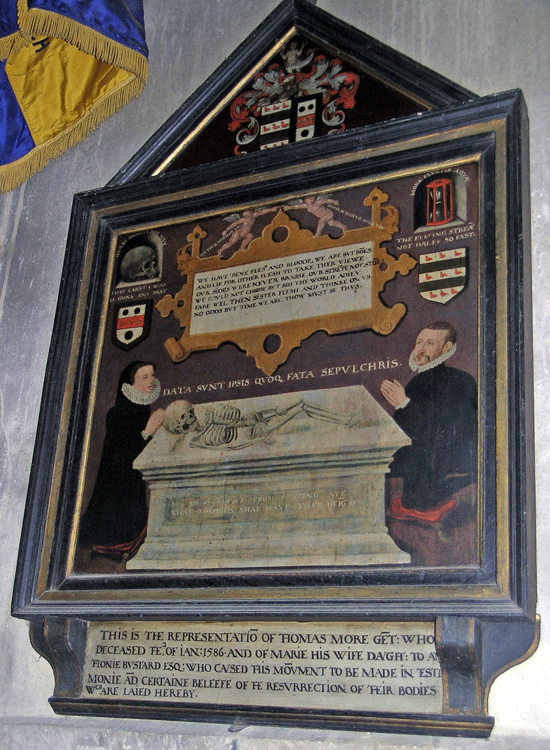 It is generally claimed that the skeleton was not that of Lord Lovell, as he had spent little time at Minster Lovell. 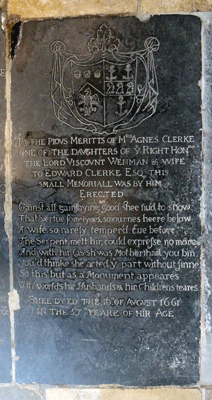 Is that logical reasoning? 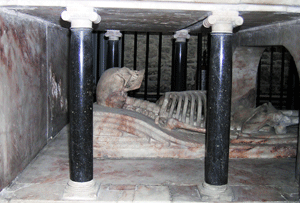 And if not, whose skeleton was it? 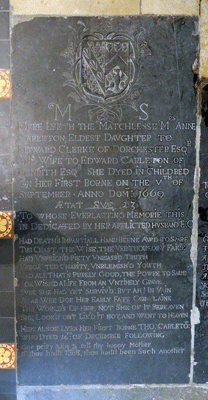 I like to think that the case is non proven and whatever the truth, it makes a good story! 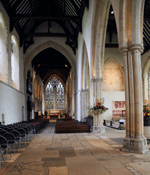 Oxford Cathedral is a cathedral of the Modern Foundation, the see being created in 1546. 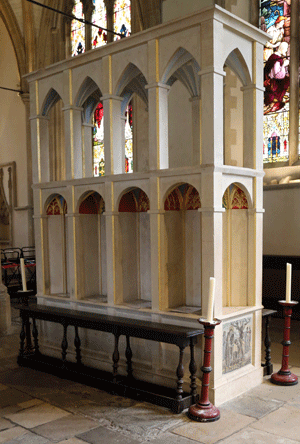 Left: St Frideswide's Shrine (1289) Reconstructed 1889-91 by J Park Harrison. 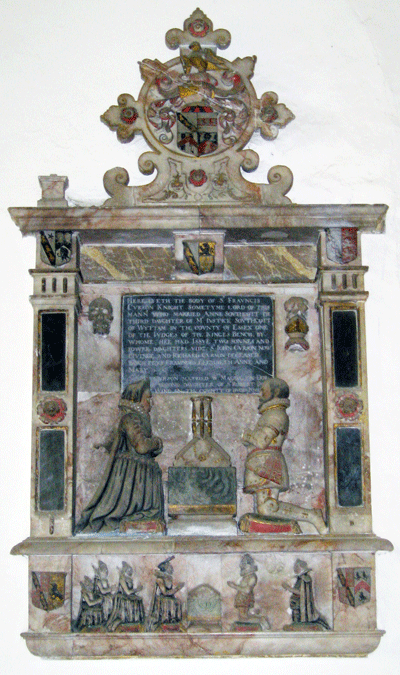 Above Left: Robert Burton (1639) The inscription refers to Melancholy. 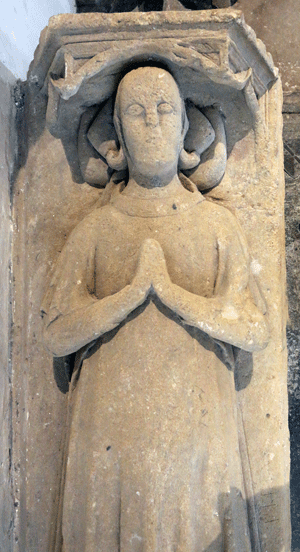 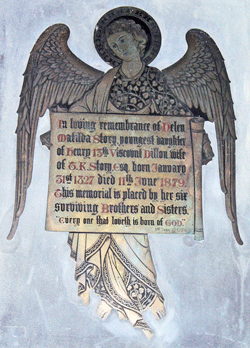 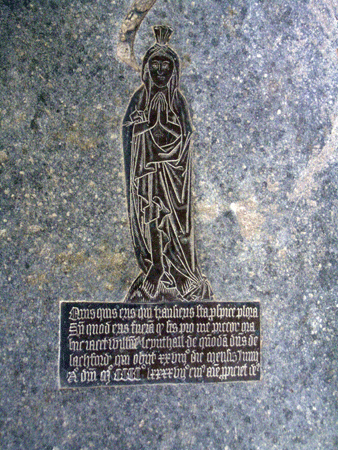 Above: Ela (1297) Daughter of William Longspée. 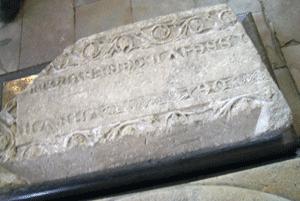 Fragment of coffin lid from Osney Abbey. 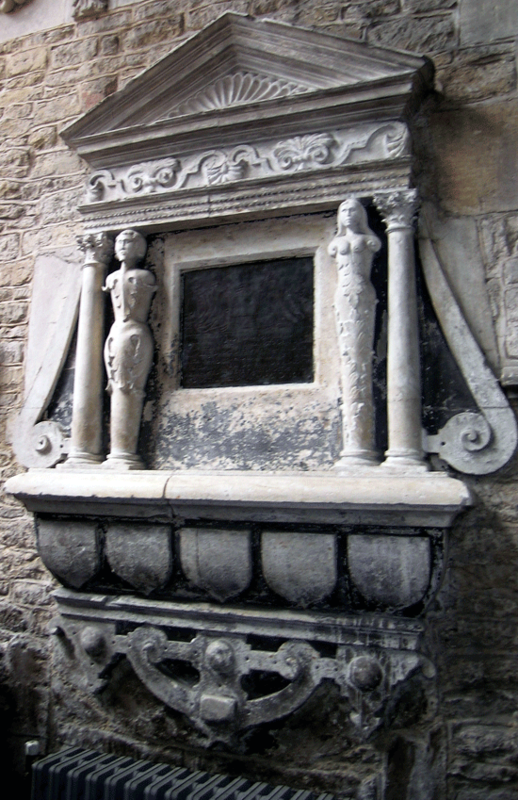 Inscription. 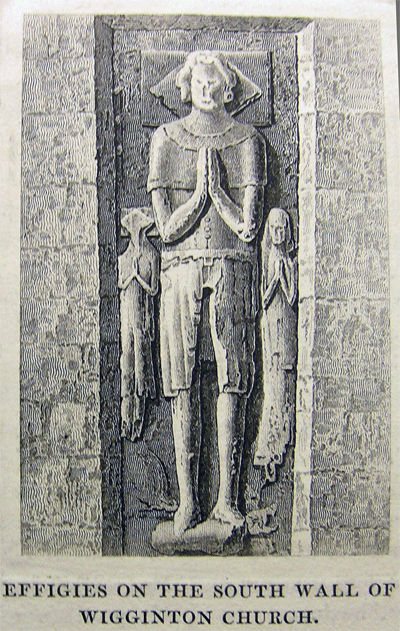 Male Civilian Effigy of the 14th Century. 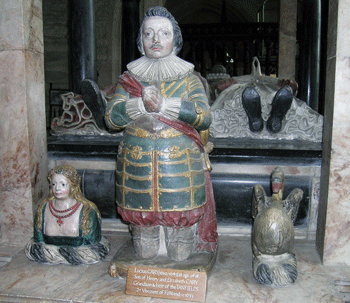 He is flanked by two small figures of his children - an unusual feature. 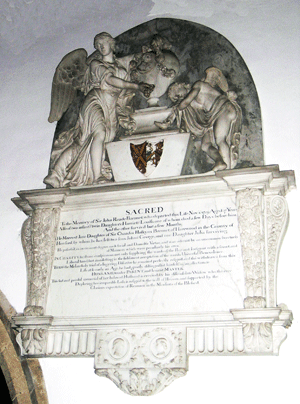 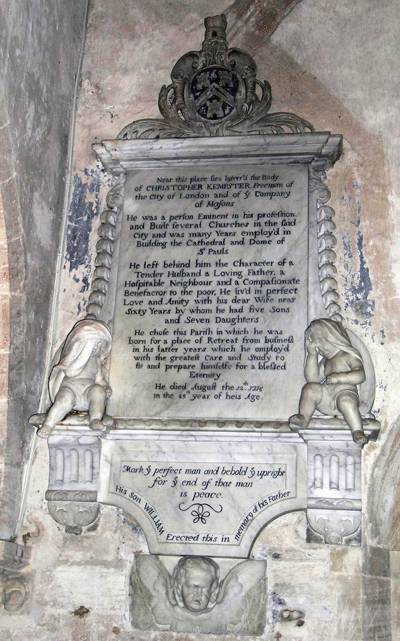 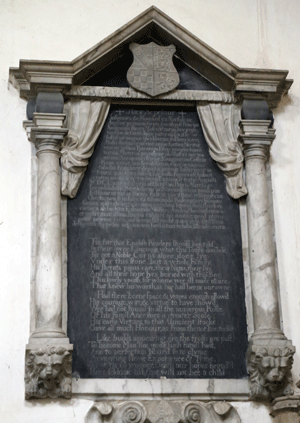 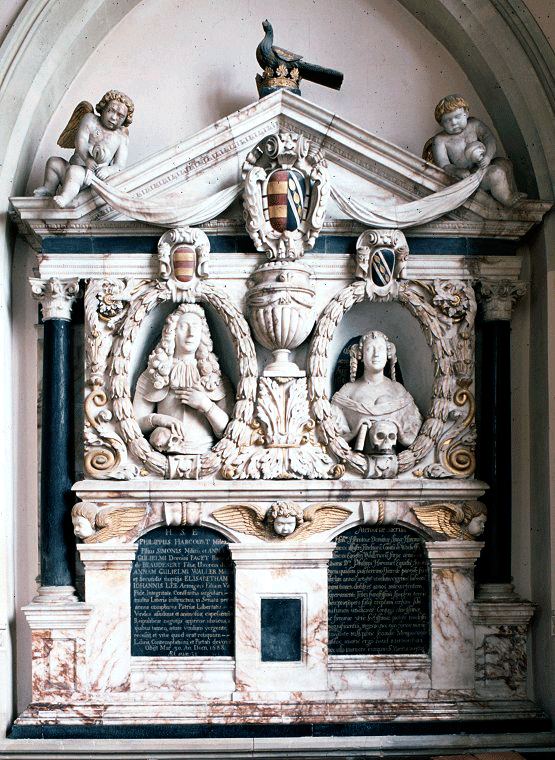 Above: Detail of the monument to Sir Henry Lee (1631) & Wife, showing details of the two main figures and the two kneeling daughters at the head, and right bottom details of the two babies at the side of Sir Henry, which are difficult to make out in the other photographs. 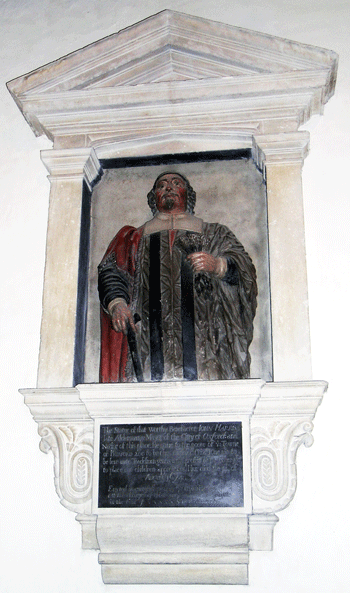 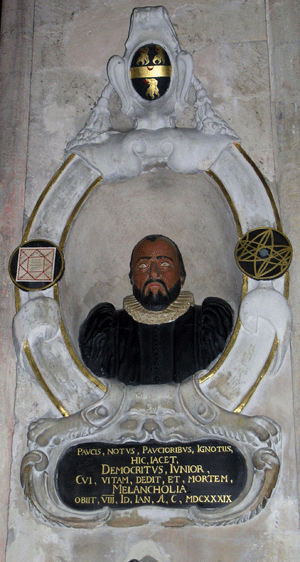 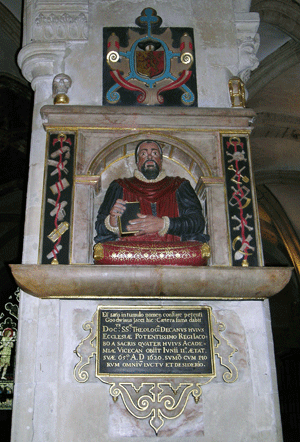 Above left:Sir Simon Harcourt (1547). 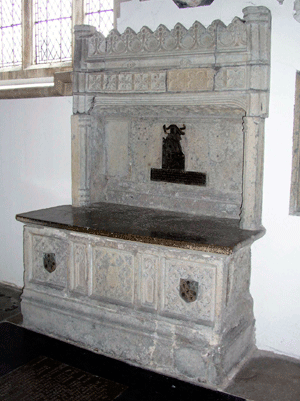 Black marble top. 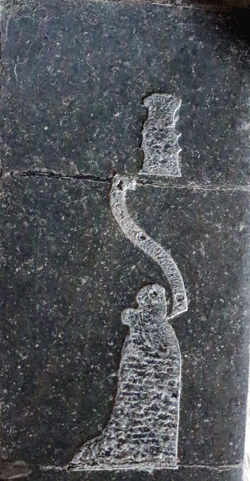 This has been reduced in length. 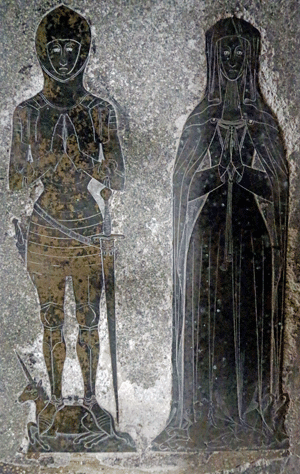 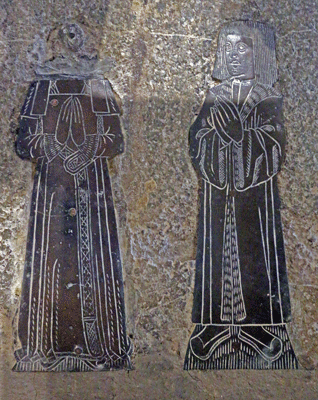 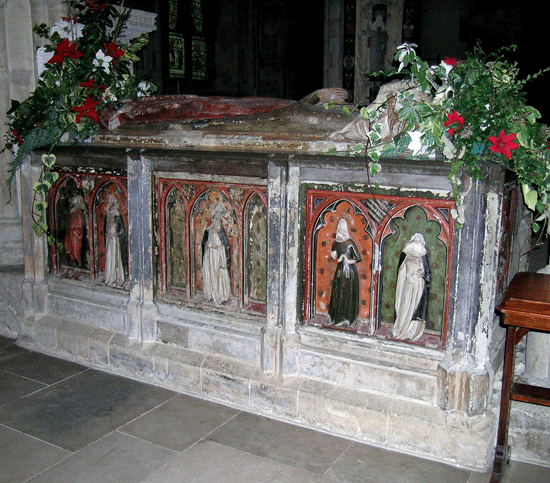 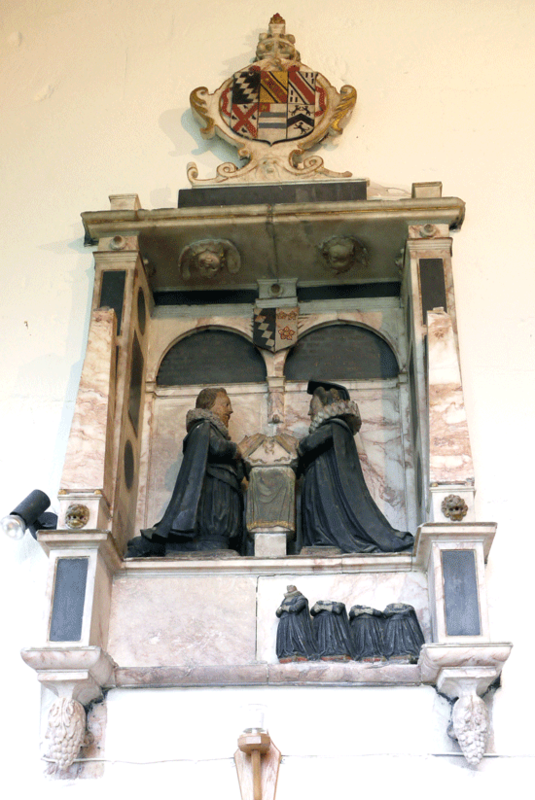 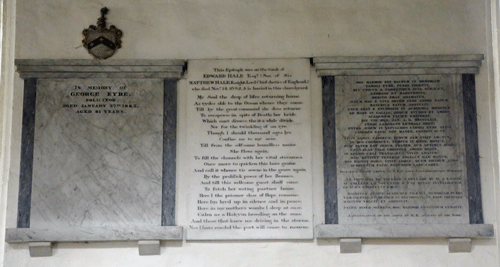 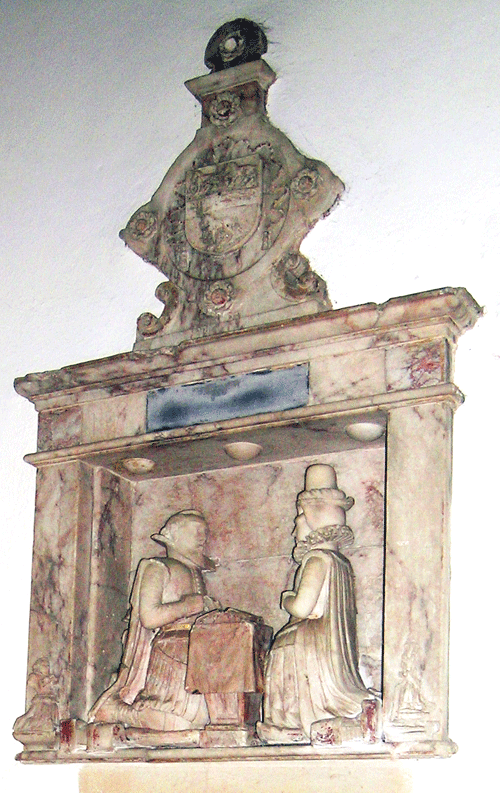 Above right: Sir Robert Harcourt (1471) & Wife. 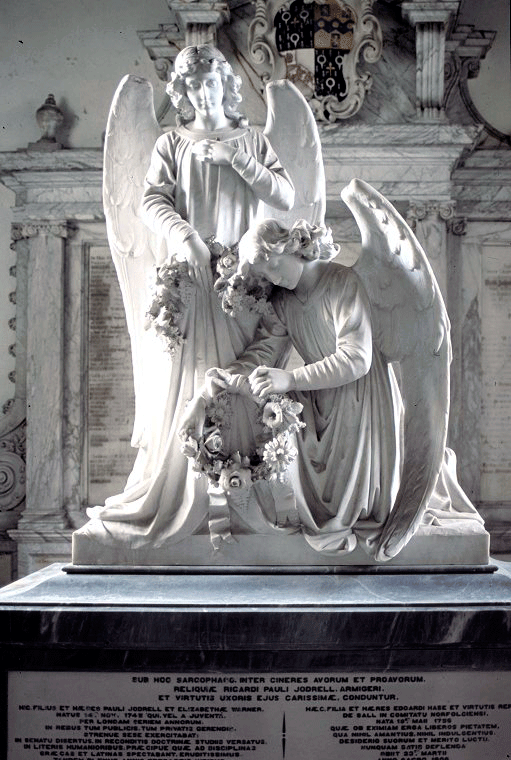 Alabaster; the painting is of the 19th century. 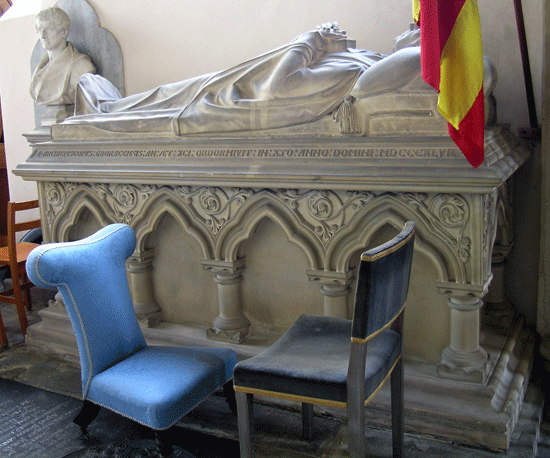 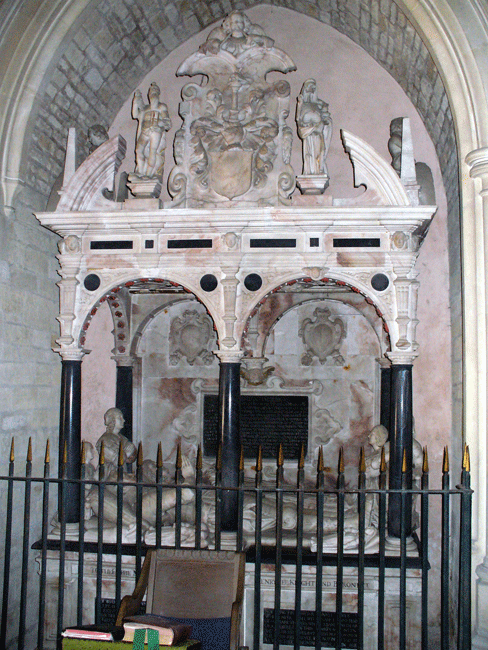 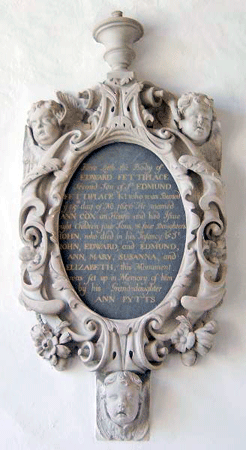 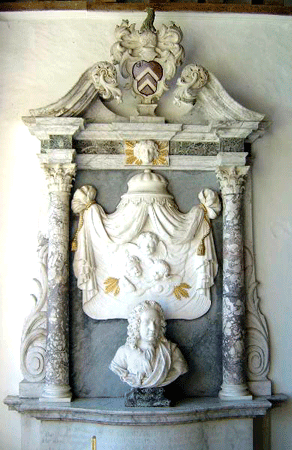 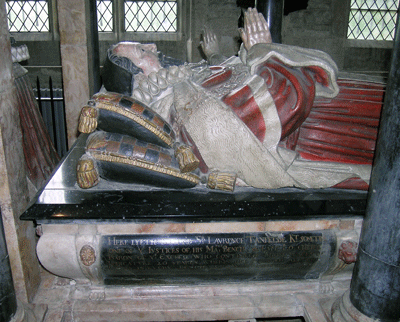 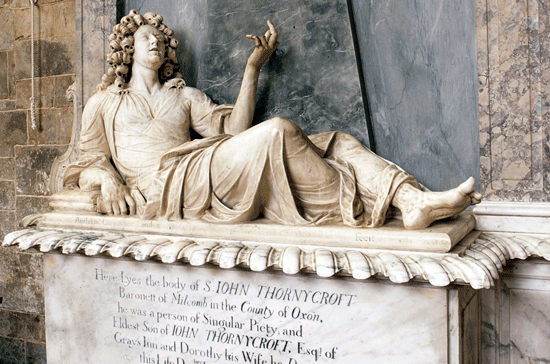 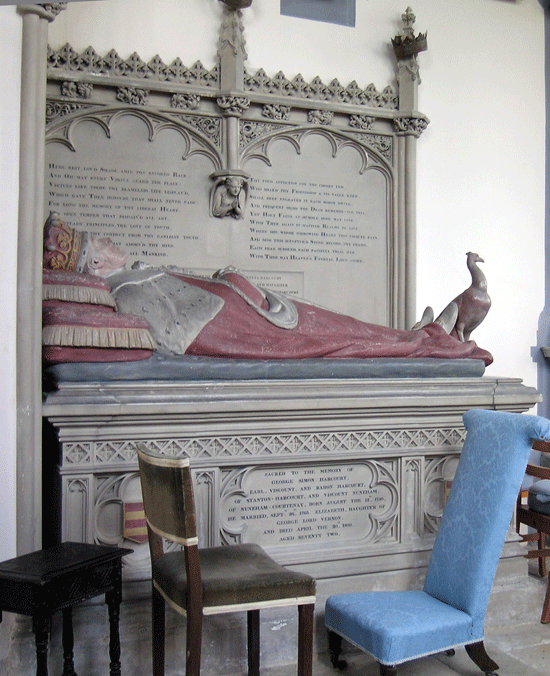 Sir Edmund Fettiplace (1613) He reclines on the top tier; below are is father and grandfather. 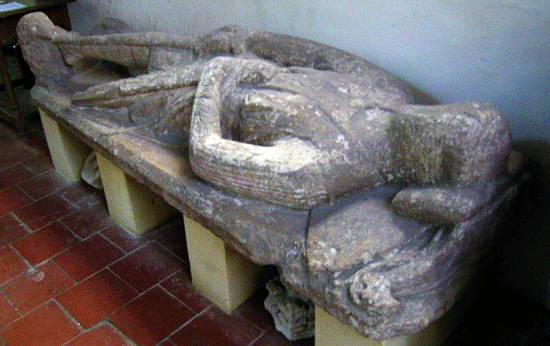 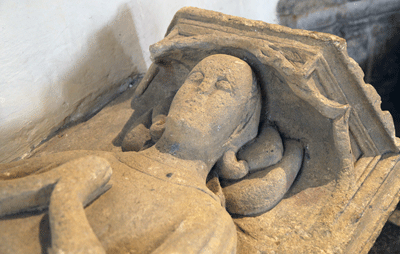 Male Civilian & Female Effigies of 14th Century. 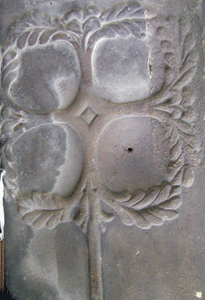 At the top is a close up of the former. 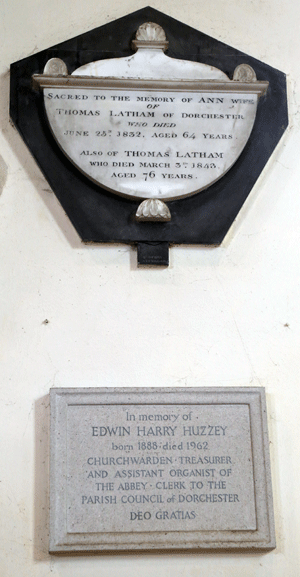 With many thanks to Miss Sally Badham FSA, Dr David & Mrs Jane Kelsall and Joan & Robert Tucker for providing nearly all of the photographs on this page. 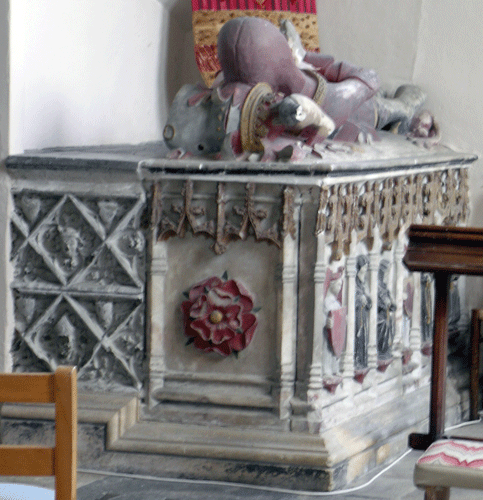 Those from Dorchester and Ewelme were taken by the Web Master.